Very cool idea! 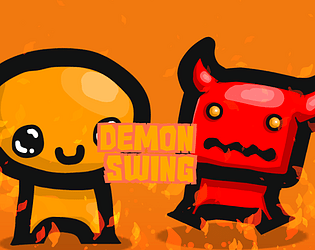 Cute art, great music and a nice forgiving swing that feels pretty good to use. 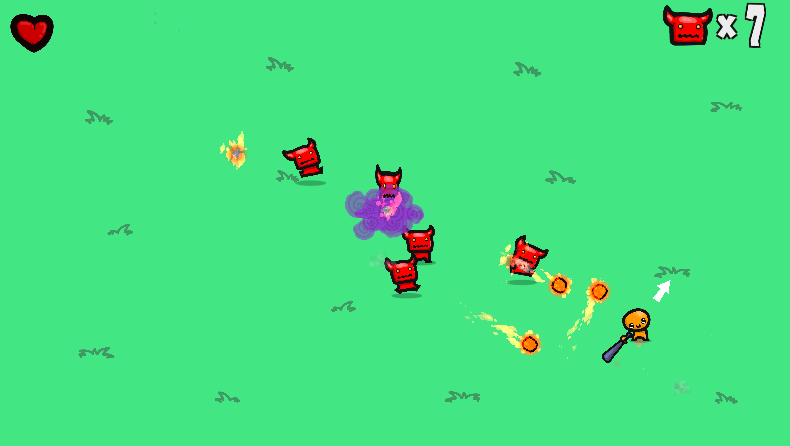 Enemies having friendly fire was a great touch too! The only bit of feedback I can think of is maybe give the player an incentive to sometimes *not* be swinging the bat (I found myself sometimes constantly mashing it) - maybe they move slower for a short period of time while/after swinging? A little bit of telegraphing on enemy attacks would be nice too. Great stuff overall! Yeah, some way to make the player not swing all the time would be a good idea. We were thinking of adding a slow down during swing or even stopping the player while swinging but it didn't make the Jan though :/. We will try to push out a new release after the voting has ended with some of these fixes hopefully :). I have not encountered the keys stuck issue myself, so I hope that it is your browser :P.
Excellent game, very addictive. I would only recommend that when the character dies it could restart without going through the main menu. In everything else an outstanding job. It can be really frustrating that you need to go back to menu every time! 29 was my highscore. I enjoyed the general gameplay and the presentation is quite nice. However, why does "restart" (which has a loading screen) take you back to the main menu? Please just let me replay the game. I also don't understand the purpose of the countdown, it just wastes time and the first demon spawning is telegraphed with the portal anyway. This is a die-often, score-chasing game; anything that slows the player down between attempts is frustrating and there didn't seem to be any purpose for these delays. Sorry to nitpick. I just think it could be more player-friendly. The game is fun and it achieves the shooter without shooting concept pretty well. Thank you, please be nitpicky :)! Very good valid feedback, I definiely agree on that restart should let you replay instantly, it was just forgotten, but should definitely be changed to restart the "game-level" instead of taking you to the menu! The purpose of the countdown was to build anticipation before the game starts. It might be too long, another idea could be to make it skippable by clicking. I love how the bat wiggles and the feedback when you hit something, that's great. The polish is really really nice but maybe one more ennemy type would have been greater. Great game anyway ! I definitely agree, we were planning on having 2 enemy types, but as usual, time and stuff :P.
We had a lot of fun creating it! Great game, I think the web player resolution is not the right one tho. It was a bit difficult to anticipate the ennemies attacks, maybe with a long attack animation ?. The feel when hitting the bullets is good and the art style is really cute. I think I fixed the resolution problem, it was a setting on the itch game page! Yeah, I agree, it is really hard to know when they will attack, will probably add some kind of projection animation or similar after the voting has ended, or perhaps upload it as a seperate version. It's indeed fixed and I had a much better experience with the game :) Good job again! There is a silly reason for the music actually :). You swing your bat, so the music is swing jazz :). Yeah there is a lot that could be done to add to the length of the game. 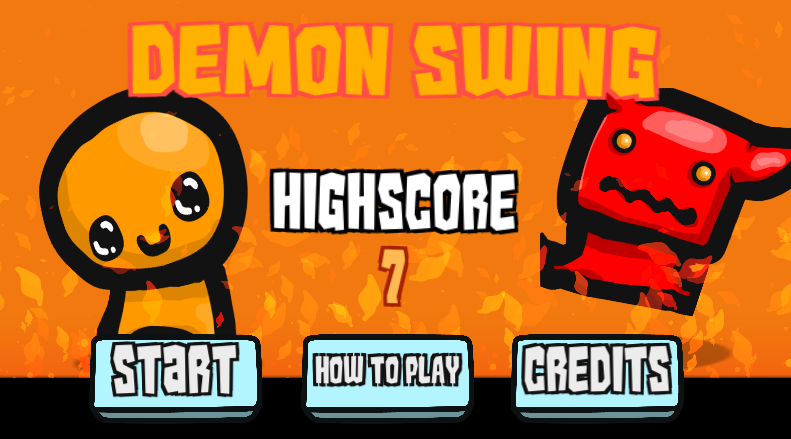 We were planning to add powerups and dodging/dashing but we ran out of time( as you usually do with gamejams :P). Your welcome, and thank you for playing! Amazing game. Loved practically everything, especially the music and art. Personally I think the demon attacks could do with a bit more telegraphing so it's easier to stay in close to them. Great job. Makes us happy to hear :)! Telegraphing would definitely make it easier to predict the enemies attacks. Might add it as a post-jam fix! In which way is the webplayer cutting off the screen? I had accidentally clicked the custom resolution checkbox on the game page, so I think it works now!